For a limited time only, purchase a copy of the award winning independent film “The Rise and Fall of Miss Thang” and get free shipping for all orders within the USA. Get your DVD today. Winner of the Best Feature Award at the International Black Film Festival of Nashville, The Rise and Fall of Miss Thang is a thrilling dance drama about a young Chicago woman who finds herself at a cross roads when her love for tap dance conflicts with her motherâ€™s expensive addiction. The film stars internationally acclaimed dancer Dormeshia Sumbry Edwards, the only woman tap dancer to star in Broadway’s Bring N Da Noise, Bring N Da Funk. Director Stacie E. Hawkins was born and raised in Aurora, IL and attended West Aurora Senior High School. She received her B.A. from the University of Arkansas Pine Bluff and her Masters in Film production from Chapman University in Orange County, California. DVD’s are only $14.99! Get yours today. 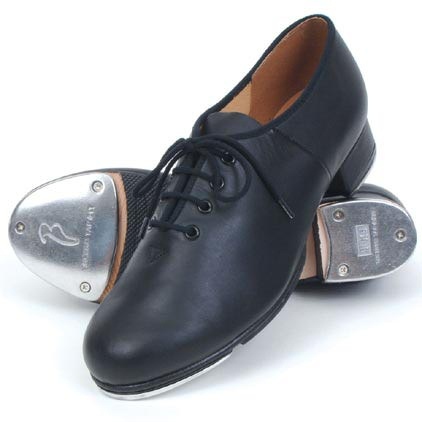 A great tap shoe for beginners, it features Capezio taps, a plastic heel and a rubber sole. Made of synthetic materials, it has matching nylon binding, a rounded toe and a gross-grain bow tie. Dancing Fair Tap shoes. Perfect to stomp some wood with. Soaps and body butters are on sale now. Take some time out for aroma therapy to easy your mind, relax your muscles and sooth your soul. 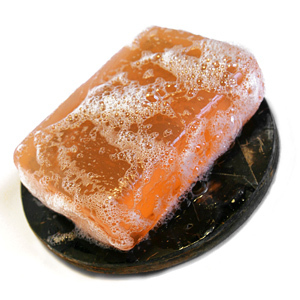 These special assorted natural soaps and body butters will make great gifts for the holidays. 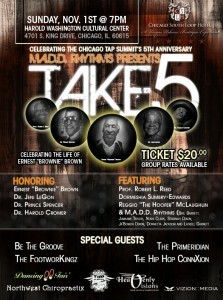 Relive the entertainment extravaganza that was TAKE 5 with this special edition DVD from M.A.D.D. Rhythms. This commemorative DVD contains 2 hours of pure entertainment, dance, foot working, hip hop, jazz and tap. TAKE 5 DVD makes a great holiday gift. Give the gift that keeps on giving – TAKE 5! Featuring performances by Prof. Robert L. Reed, Reggio McLaughlin, Reggio “The Hoofer” McLaughlin, Dormeshia Sumbry-Edwards, Dr. Harold Cromer and M.A.D.D. Rhythms. Special guests performances by Be The Groove (Rhythmic Performance Ensemble often compared to Stomp! ), The FootworKingz (Finalists on America’s Got Talent, Touring with Madonna), The Primeridian (Underground Hip Hop, Jazz, Soul and Funk eclectic group), The Hip Hop ConnXion (one of the leading hip hop dance troupes in Chicago) and Chicago’s own Ben “Jammin” Johnson. 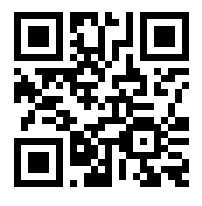 If you missed it, here is your chance to see. If you saw it here is your chance to relive it. TAKE 5! Pre-order your copy of the TAKE 5 DVD before Christmas for $20.00. (After Christmas $25.00). 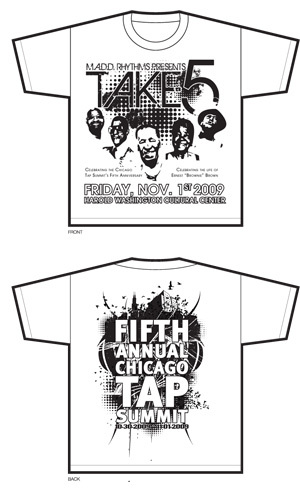 The official T-shirt of the Fifth Annual Chicago Tap Summit is on sale now for a limited time only. 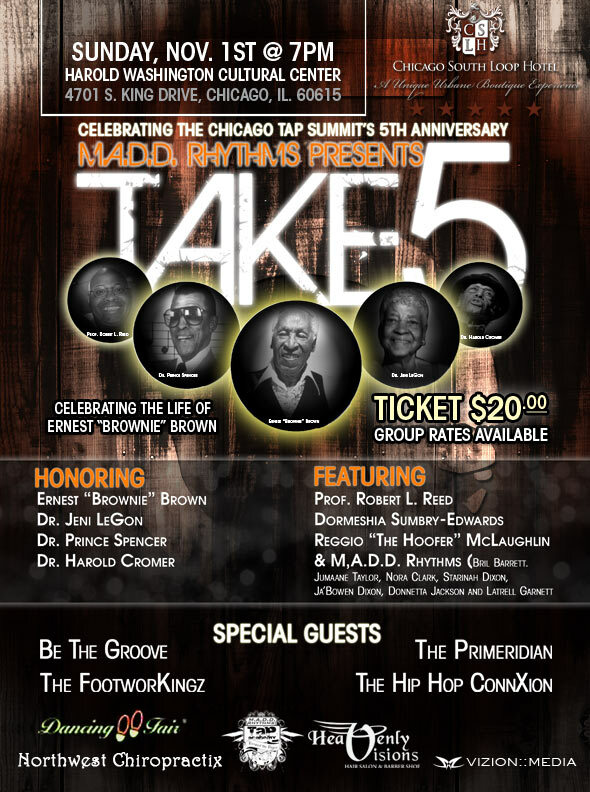 Get your TAKE 5 / Fifth Annual Chicago Tap Summit tee today. Supplies and sizes are limited.